Physical Description : Attractive. Appears completely Human. 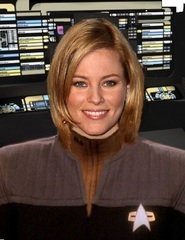 Sydney Sloane is the second android form (third form all together) of Lt.Commander Sydney Sloane Mark III . After ruled malfunctioning by the Starfleet Command Council, Sydney escaped from certain deactivation and went into hiding. With the help of Admiral David Luc Sydney took the form of injured and brain-dead officer, Captain Breanne Neal , becoming the first ever human-oid (human body with a posatronic brain). However, the human host did not last long, as Breanne was injured in combat against the Rukukon. Sydney's brain was then transferred into the current android body, created by Max Hertzog. Sydney Sloane served under Admiral Luc in his defector Starfleet faction. She was assigned to Project Infinite as Luc's liaison, in order to establish a solid foundation for a Starfleet reconciliation. Believing the Rukakon to be a common enemy, the two factions of Starfleet worked together, albeit on shaky ground. She also served as acting-first officer on the USS Revelation, under Captain Greg Duran, her fiance at the time. After the destruction of the USS Revelation, Sloane requested a transfer to Earth. There, she was assigned to the Starfleet Corps of Engineers. During her assignment, she was promoted to Commander. Sloane recently has been transferred to K-7. THE REMAINING REPORT HAS BEEN CLASSIFIED BY STARFLEET COMMAND. Sydney is kind and loyal to a fault. She stands up for what she believes in, and is willing to risk her own safety to help those she cares about. 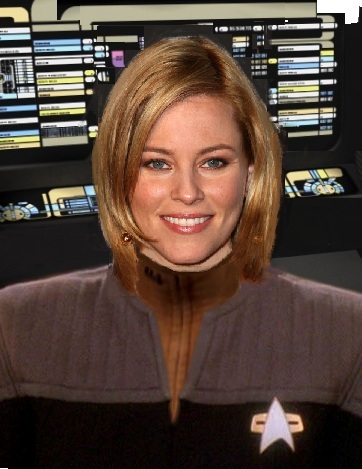 Sydney was once engaged to Captain Greg Duran, who later died on the Revelation. Her closest friend is Evan James McNamara , who lovingly refers to her as "Ace", a nickname given to her for her exceptional piloting of a Starfleet Crescent Wing-Fighter. Sydney harbored feelings for Evan McNamara for several years. The two became involved in a brief romantic relationship, but they both agreed it was better to remain friends.